Life in the fast lane is certainly possible now that March Fourth Marching Band has a new bus, and my life has certainly adopted a new pace since I moved up to Portland in March with the hope of joining the M4 dance team. I met most of the band last summer at High Sierra Music Festival after I got pulled on stage for their dance contest (I didn't win-there was this awesome old man busting some serious moves, but it did get me some very important introductions). The rest of Samba Stilt Circus crew, who I have been performing with for the last 5 years, was backstage with me after the show, being silly and causing our usual scene and a magical fusion of musical circus freaks was inevitable. The next day many M4 members joined us for our parade and when we were hanging out at their camp later, Aaron (one of the awe-inspiring stilters) remarked that the dance team sometimes found itself needing more flyers for their acrobatic stilt pieces and he thought I might be a good fit. We tried to find a way to get me up to Portland to train and see if I was really up for it (I was like "I'll grab my backpack, let's go!") in September but the band's touring schedule was too packed and the timing wasn't quite right. I was a bit disappointed and kind of put the possibility to the side while I made plans to travel to Mexico and Cuba for the winter and return to Stanford in the Spring. I started writing my application for re-admission and everyone who read the first draft commented that they weren't convinced I was really excited about returning. I tried to dial in the direction I wanted to take my studies (thinking more about mythology and tying it into modern performance) and get excited about being a student again but I was having a hard time making myself feel like I was ready. I sent an email to Aaron just to remind him I was still interested but hadn't heard anything back so I put the final touches on my essay, met with my advisor, and she was just waiting for my go ahead to put it through the system. Two days before I left to Mexico I was performing at Sea of Dreams New Years Eve party, where M4 also happened to be performing. Raina and I stopped by their green room to say hi to everyone between their shows. Aaron was the only one around and we touched bases for a quick moment before he had to go back on stage. Turns out he hadn't received my email, but the next morning he sent me a message saying there was a good chance the dance team had a spot for me for the next touring season and asking about my availability. Heart pounding, I called back to say, "Well, tomorrow I leave for a trip for 2 months, I'll be back in the states in March and I was planning on going back to school….but that sounds much more interesting!" No promises he said, and definitely no financial support for the training period, but if I could come up and make myself valuable by learning the material there was a good chance I could get on a tour "at some point." As soon as I made the decision to throw it all to the wind and pursue this dream of running away with the "circus", everything began to fall into place. I flew home from Mexico just in time for my Grandma's amazing 80th birthday party and then 3 days later happened to get a perfectly timed ride up to portland with Dave (who was helping Sophia build her timber frame house) with just a few possessions (mostly costumes) and a ton of enthusiasm. Aaron very generously let me stay with him for the first couple weeks while I figured out where to live and was a huge help as I began to make marching band costumes so I would be ready when the time came. My first night in Portland we had a rehearsal and he threw me (quite literally) right into the acro stilting stuff with another guy who was very new to the whole thing himself-a little sketchy but we pulled it off somehow. I had never done acrobatics on stilts before but I trusted Aaron and it seemed to come very naturally. That first night I learned most of the piece they were currently performing. For the next month and a half I rehearsed constantly. Often I was the only one to show up to rehearsals because the band had been touring pretty much all year and people seemed to need a break before the next tour. It was a little frustrating but it was also important for me to put in my time and learn the material on my own (mostly from videos). When other dance team members did show up it was awesome and I began to form inspiring friendships and working relationships with all of them. Mid April the band had a couple local gigs to thank all the people who contributed to the kickstarter fund for the new bus. An opportunity for me to work the merchandise table came up and I jumped on it, impressing the band by showing up in full costume. That night Latisha, one of the other stilt dancers, asked me if I could possibly fill in for her the next night and suddenly there I was, stilting in a parade at Reed College, rushing to the night venue to set up merch, throwing on my stilts to perform the acro piece and then flying back to the merch table to finish up the night selling shirts and hats and band-made garb. I had a couple more opportunities to perform at local gigs and started to get the hang of things and feel solid with the other dance pieces as well. I got a lot of positive feedback from the other dancers and the band and it was such an amazing, affirming feeling to know that my hard work was beginning to pay off. Aaron said that it sounded like everyone was on board to try to fit me into a tour by fall at the latest, which seemed a little far away but I was really beginning to love Portland and the idea of actually being around to see the sun was appealing. I found an awesome room to sublet for super cheap a few weeks after moving to Portland and I also got a great job as a bilingual nanny for a wonderful family that lived right on the edge of the biggest park in the city. Dez and I spent most of our time exploring the park and the rose gardens and it was amazing for me to re-create some of the magical experiences I'd had with my nanny Peggy with him. After those first few gigs I got a surprising message from Aaron saying he was trying to work out the scheduling for the 4th of July Independence tour and that it looked like they might actually need me sooner than expected…and here I am! The last couple weeks have been a whirlwind. Somehow I had time to meet up with Samba Stilt to perform at Symbiosis Festival in Nevada...but that's a whole other involved story for another time though. I will say it was amazing to be on the shores of Pyramid Lake but there was a lot of controversy about the use of sacred Native land for a music festival that left me seriously questioning the whole West Coast "tribal festival culture" and its intentions. It's tricky business being hired for events when you don't support the way they are being run. I pledged to be sober the entire time out of respect for the tribe and we tried to do our part to honor the land and the lake by leading a samba parade for Ochun, the goddess of the freshwater and asking for her blessing. I flew home to California on June 21st, had an epic night at my favorite dance spot, Little Baobab, in San Francisco with great friends, and then drove up to Boonville to perform with Samba Stilt Circus at Sierra Nevada World Music Festival for the weekend. 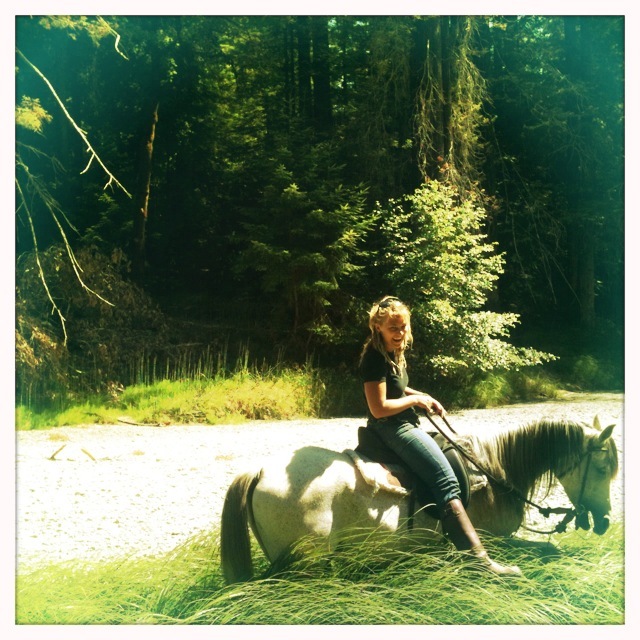 Then I spent a few wonderful days at the farm, riding horses, swimming in the river, and catching up with friends and family before meeting the band at the Marin County fair for the first show of the tour. A quick visit back to the farm! Energy was high, the weather was hot, but the footing in front of the stage was less than ideal. When Aaron put me up on Sid's shoulders toward the beginning of the acro piece I went a little too far forward, throwing off Sid's footing enough that he couldn't recover amongst the gopher holes and suddenly we were both on the ground. Somehow it was an amazingly smooth fall and I threw up my hands and smiled. Aaron picked us both up and we were able to pretty much finish the piece. Much of the band, and probably most of the audience, barely realized that anything had gone wrong, though Sid and I were both rather shaken and his sensitive knee was not thrilled. Luckily we had a full day on the road on the way to Colorado to recover and a space to rehearse before our next show in Crested Butte. I was nervous before the acro piece but the crowd was amazing (I think the whole county came out!) and we pulled it off flawlessly and my confidence began to return. It turned out my friend Cyd's friend Ben who I had met in Boonville last summer had just moved there and we recognized each other on the street in town. Later that night his household had an amazing party for us that was the perfect end to a great show. The next day we headed to Avon, which was a very surreal-feeling tourist/resort town that surprised us by coming out in the rain ( we seem to be bringing it with us everywhere we go, which people are super grateful for, considering most of Colorado is on fire right now. The base drummer Alex is calling this our "Forest Fire Relief Tour!") and holding a super fun after show/party during which a few of our horn players jumped on stage. My amazing friend Bethany came all the way down from Boulder to see the show and it was so invigorating to see her out in the crowd, getting everyone dancing and jumping. I was planning on having a lazy night in because I felt exhausted and knew we had a huge day ahead of us (2 double sets in 2 different towns for the 4th), but the energy of the group and Miss Hell's assurance that I "can sleep when I'm dead" won out. The Fourth was a crazy day indeed…we woke up, drove a few hours to Frisco, got the bus stuck trying to park, frantically set up, did an unexpected parade, played a full set, packed up in record time, drove 3 hours to Glenwood Springs and did it all again. Frisco felt very much like a typical fourth of July celebration in the sun, whereas Glenwood Springs doused us with rain yet again but blew us away when we realized how committed and enthusiastic the crowd was. Sadly we couldn't stay for the after party at the bayou…we drove a few hours to a campground, enjoyed the moon peaking out from behind the epic red cliffs and collapsed into bed. 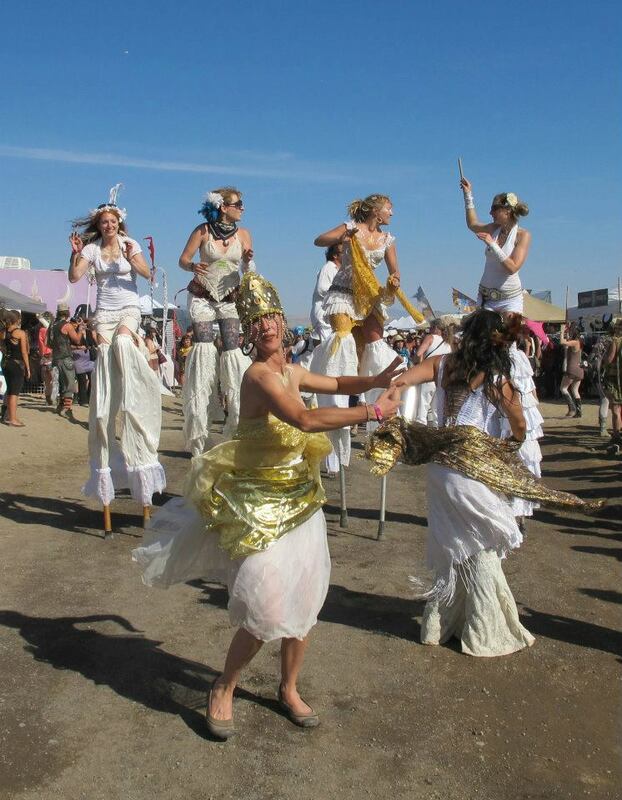 I was exhausted but couldn't get to sleep…my mind was wide awake thinking about ideas for the new stilt acro piece we have been asked to have ready for Oregon Country Fair. Once I finally stopped tossing and turning I had a terrible dream that involved my mom and grandma stuck in a house fire. When I woke up I realized I needed to check in with home and spend some time checking in with myself as well. Luckily I was able to find a peaceful spot on the river to do so. I was relieved to find everything was fine at home, and refreshed after spending a few minutes alone. It's a challenging thing to find privacy and quiet on the road but I'm slowly learning it's oh so important. In the morning we continued on to Ridgeway where we were greeted with lightening and pounding rain. The stage was very precarious with very little room to dance and we all started the show a little skeptical, especially after the power went out right before we were scheduled to start. But they fixed the problem, the rain miraculously stopped, the crowd stuck it out, and we ended up having a great show. The dancing, awe-struck kids asking for autographs really made it for me! We didn't do the stilt acro piece, which I felt bad about after, but right up until it was time to start the footing seemed dangerous and I knew I had to trust my instincts in order to keep myself safe. Now we are on the road, headed to California for High Sierra Music Festival, bringing it full circle back to where I met the band, and I must say I am feeling full in all the best ways. I can not imagine a more inspiring, fun, wacky family of people to be traveling around on a bus with. We have laughed 'till we cried, danced and played in rain and performed out hearts out at altitude until we could barely breathe, created a scene everywhere we've been with our crazy, colorful garb and loud playful demeanor, and brought joy and life to every town we have visited. And this is a short tour…..